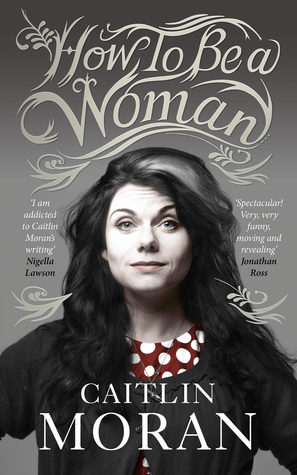 How to Be a Woman by Caitlin Moran had been floating around in my peripheral vision for some time before a noteworthy recommendation from Ariel Bissett put it fully on my reading radar. Because I trust Ariel’s opinions and have never been led astray by her recommendations in the past, I decided to download the audio book version that she had listened to and endeavored to give it a go myself. Again, I really wanted to like this book because Moran is coming from an important and unique perspective when it comes to modern feminism. At times it feels as though feminism is discussed primarily by those in academia or politics, when in reality it should be a common topic of conversation among everyone. Gender inequality impacts people regardless of their level of education, socioeconomic status, or political affiliation and therefore everyone should be able to have a say in the matter. I wholeheartedly agree with Moran on this point and wish that this message would have been executed and delivered in a different manner. It’s difficult to explain, but while listening I felt like the book could have been toned down several notches overall. She almost seemed to be attacking certain women for liking things that may be considered stereotypically feminine. Is it so terrible if I actually like my designer purse or enjoy shopping for clothes or wearing bras? Her constantly pessimistic view towards numerous aspects of many women’s lives was quite off-putting and made me scratch my head more than a few times. Was she really arguing for gender equality if she was denouncing many of the ways by which some women feel more feminine or allow them to identify as women? Though I began this book with an opened, eager, and excited mind, unfortunately I cannot shake my mixed feelings towards How to Be a Woman. I do appreciate the presentation of this memoir/nonfiction book, especially the engaging, hilarious, witty narration of the audio book as well as the message that it attempts to deliver. Its intentions may be in the right place; however, in my eyes it missed the mark and went a bit beyond the line of a coherent, realistic message and an effective delivery. While I most likely won’t be returning to this book in the near future, I have certainly gained a new appreciation for the way that Caitlin Moran loudly and unashamedly voices her bold, brutally honest opinions. Would I recommend it to a friend? : Yes, but I would probably warn them ahead of time about Moran’s rather in-your-face delivery of her message. Also, they would have not mind an abundance of cursing, discussions that could be considered “too much information” by some people, and a lot of strong opinions. Have you read this book before? What are your thoughts on it? Would you recommend any of Caitlin Moran’s other writing? Let me know in the comments section below! The book actually sounded interesting at first, but from your thoughts, I don’t think I’d enjoy it. Almost like your experience with the book itself 😛 Great review! Interesting to read your review…it mirrors my thoughts about the book. I enjoyed it while thinking to myself in some parts it was too much. Having said that, I would expect no less from Caitlin Moran.She writes about herself, not me. Just have to remember that when reading it. Well now, I am thoroughly curious! I have to say I must add this to my list of books to read this year.